Migraine is a common and debilitating episodic disorder characterized by intense head pain that can be accompanied by nausea and sensitivity to light (photophobia) and sound (phonophobia). This high prevalence (up to 15–20% of the adult population) has led the World Health Organization to rank migraine in the top 20 conditions leading to years lived with disability. It is more common in women than in men, and occurs in two major subtypes, migraine with aura and without aura. In migraine with aura (20% of the cases), the migraine headaches are preceded by a visual hallucination/illusion known as an aura. Typically, the aura begins in the visual field and expands during a 5–20-min period, and is usually followed by headache. 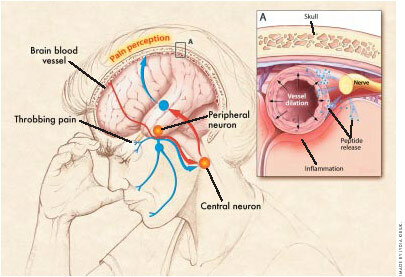 In migraine attacks, there are both vascular and neurogenic components. Nowadays, many believe that the disorder is due to a mutation of a calcium channel gene, rendering some CNS neurons unstable and capable of initiating a migraine attack (the phenomenon is called cortical spreading depression). As part of the pathophysiological mechanisms of migraine, the trigeminovascular system is activated (putatively as a defence mechanism) and there is release of CGRP and activation of the trigeminal nucleus caudalis (TNC), with subsequent mediation of pain. Based on preclinical and clinical studies, the neuropeptide CGRP is proposed to play a central role in the underlying pathology of migraine. Over 20 years ago, it was reported that plasma CGRP levels are increased during migraine. Elevated CGRP has also been reported in the saliva of migraineurs. Remarkably, injection of CGRP induced a delayed, migraine-like headache in 57–75% of migraineurs with and without aura. Because CGRP did not have this effect on healthy controls, it suggests that migraineurs have increased sensitivity to CGRP. Further evidence for CGRP having a central role in migraine has been demonstrated by data from studies showing that successful treatment of migraine headache pain with the serotonin 5-HT1B/1D receptor agonist sumatriptan, as well as other ‘triptan’ drugs, resulted in the normalization of CGRP levels. Calcitonin gene–related peptide (CGRP) is a 37-amino-acid neuropeptide, first identified in 1982. It belongs to a family of peptides which includes calcitonin, adrenomedullin and amylin. Localization studies have shown a wide distribution of CGRP immunoreactive structures in the peripheral nervous system and in the CNS. In humans, CGRP exists in two forms, termed α-CGRP and β-CGRP, the former being the main form expressed in primary afferent C and Aδ fibres of spinal and trigeminal ganglia neurons and the form most essential to migraine pathology. By contrast, β-CGRP is primarily expressed in enteric nerves and in the pituitary gland and its rule, if any, in migraine is not known. In CNS, CGRP- containing cell bodies have been found in a number of areas that may play an important role in migraine pathophysiology, such as the hypothalamus (trigger), superior collicoli (visual symptoms), inferior collicoli (phonophobia), brainstem and trigeminal complex (head pain, nausea), and cerebellum. CGRP immunoreactivity is especially prevalent in the trigeminal nerve, where it is found in nearly 50% of the neurons. Its expression in the trigeminal nerve is of particular interest given the role of the trigeminovascular system in migraine. The term trigeminovascular system is frequently used to describe the morpho-functional basis for the generation of vascular headaches. The peripheral trigeminovascular system consists of sensory fibres of the trigeminal ganglion that project from meningeal blood vessels (both dural and pial) to brainstem trigeminal nuclei complex . The CGRP-containing cell bodies of the trigeminal system are bipolar and have functional connections with neurons in the trigeminal nucleus caudalis and in its related extensions down to the C1 1-2 levels. The central trigeminovascular system refers to regions of the central nervous system that further process the nociceptive input: the spinal trigeminal nucleus and posterior thalamus. Trigeminal fibres mediate dilatation of brain vessels, mediate increases in cerebral blood flow, and participate in the trigeminal vascular reflex. The current view suggests that the activation of this reflex is a defense mechanism against cerebrovascular constriction elicited either due to spreading depression or other localized cerebrovascular vasomotion. Cortical spreading depression (CSD) occurs when a focal stimulation of the cerebral cortex results in a slowly propagating wave (2–6 mm/min) of neuron and glial hyperactivity followed by a prolonged suppression in neuronal activity. The cerebral circulation requires high and constant flow and metabolism; hypothetically, cerebral vasoconstriction is sensed by the trigeminal sensory nerve fibers with a subsequent antidromic release of CGRP to maintain local brain blood flow within normal limits through intense vasodilatation. The trigeminal activation results also in dromic activation of neurons in the trigeminal nucleus caudalis with subsequent second-order neuron involvement. The CGRP receptor is a heterotrimer: a large peptide with 7 transmembrane domains, named calcitonin receptor-like receptor (CLR or CRLR), is supplemented by a small single transmembrane peptide, named receptor activity-modifying protein (RAMP1) that forms the CGRP-specific ligand binding site. 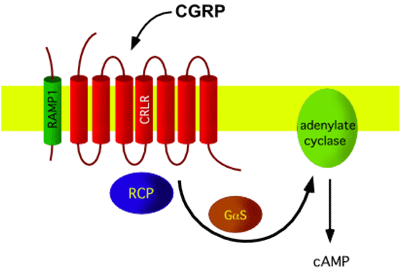 In addition, a small intracellular protein component, called receptor component protein (RCP), is necessary for linking the receptor to the intracellular signal-transduction machinery, which operates mainly through G protein Gs and adenylate cyclase, resulting in elevated cAMP levels. CLR shares 55% sequence identity with the calcitonin receptor. RAMPs are relatively small (148-175 aminoacids) proteins which enable expression of CLR on the cell surface, determine the glycosylation state of the receptor, and determine the relative affinity of this receptor for CGRP. CGRP receptors are expressed by multiple different cell types within the nervous, cardiovascular and immune systems that are thought to play important roles in migraine pathology: on cerebral vascular smooth muscle, where they cause vasodilation, on dural mast cells triggering their degranulation, at the central terminals of the trigeminal nerve, where CGRP is a neuromodulator at second-order nociceptive neurons in the spinal trigeminal nucleus caudalis and in the dorsal horn of the spinal cord, where CGRP has a similar role in inducing central sensitisation to tactile stimuli. Perivascular release of CGRP from the trigeminal nerve induces vasodilation and dural mast cell degranulation, which both contribute to neurogenic inflammation. Neurogenic Inflammation describes a sterile, inflammatory event that occurs as a result of sensory nerve activation and is characterised by vasodilation, plasma protein extravasation, and release of proinflammatory and inflammatory molecules from resident mast cells. Vasodilation is due to CGRP action on vascular smooth muscle. Extravasation is caused by substance P, which is often co-released with CGRP. The inflammatory cascade can be triggered by CGRP actions on dura-resident mast cells and satellite glial cells of the trigeminal ganglion. Mast cells are bone-marrow derived cells that are involved in normal immune responses and allergic reactions. CGRP receptors are clearly present on mast cells in the dura mater. These mast cells lie adjacent to both sensory neurons and the vasculature. Mast cell activation and degranulation lead to the release of several neuroactive and vasoactive substances. These include bradykinin, histamine, prostaglandins, tumour necrosis factor α (TNF-α), vascular endothelial growth factor and serotonin. The release of these inflammatory and proinflammatory agents can potentially generate a positive-feedback loop onto sensory neurons because they trigger CGRP release. An inflammatory soup (low pH, bradykinin, 5-HT, prostaglandin E2, histamine) induces CGRP secretion from trigeminal sensory neurons. This elevated secretion is predicted to be long lasting because cytokines also activate CGRP gene transcription. Importantly, an inflammatory response triggered by chemical induction of mast cell degranulation sensitizes primary sensory neurons that innervate the dura of the meninges, with the lowering of the pain response threshold to previously innocuous stimuli, such as blood vessel pulsations and head movements. Mechanosensitive neurons innervating the dura show increased activity shortly after degranulation and remain hyperactive for hours. It is believed that these excitable neurons have a key role in promoting intracranial migraine pain. Increased activation of these primary afferent neurons also resulted in increased activity of neurons in the TNC. Further evidence for mast cell actions being mediated by peripheral nociceptors is that sumatriptan, an antimigraine medication that inhibits CGRP release from these nociceptors, can block the effect of mast cell degranulation on the TNC. In the trigeminal ganglion, satellite glia are intimately associated with neuronal cell bodies and are able to influence the local microenvironment similarly to glial functions in the CNS. Recently, satellite glia have unexpectedly been shown to behave much like mast cells in response to CGRP. Neuronal cell bodies contain the necessary machinery for releasing neuropeptides, so a mechanism for release of CGRP within the ganglion exists. Trigeminal ganglion preparations have also been shown to release CGRP in response to a combination of nitric oxide donors and inflammatory stimuli. CGRP treatment of satellite glia increases proinflammatory cytokine release and actions that can sensitise sensory neurons. This is a direct response because satellite glia contain functional CGRP receptors. As with the actions of CGRP on mast cells, it has been proposed that CGRP could have a role in activation or sensitisation of the sensory neurons by satellite glia. The further synthesis and release of CGRP from the neurons would then generate a positive-feedback loop that would enhance and sustain the inflammatory state and neuronal sensitization. The positive-feedback loop might include not only CGRP, but also an alternative splice product from CALCA, the gene from which CGRP is transcribed. CALCA also encodes the hormone calcitonin (CT). Normally, neither CGRP nor CT is expressed in satellite glia because of repressive epigenetic marks. However, whole organ culture of the trigeminal ganglion results in ectopic CGRP expression in satellite glia, presumably as a result of inflammatory signals. Circulating levels of proCT are generally quite low in healthy individuals. Serum proCT levels have been reported to increase several thousand times during sepsis, a severe inflammatory response that generally occurs in response to bacterial infection. A recent study reported increased serum proCT in migraineurs during attacks when compared with baseline levels. Although the levels during migraine are much lower than those seen in sepsis, the idea that proCT and inflammation are linked under other conditions suggests that the meningeal sterile inflammation believed to occur in migraine could lead to local release of proCT. CGRP and its receptor are widely distributed across the CNS. As such, CGRP has been suggested in a number of centrally mediated activities that might be relevant to migraine, including anxiogenesis, stress responses, nociception and light aversion. Recent studies have laid out an anatomical pathway for photophobia that is well positioned to be modulated by CGRP. Photophobia in migraineurs who lack image-forming vision but retain the ability to detect light suggests that a nonvisual pathway is involved in the potentiation of migraine pain by light. This observation implicates the intrinsically photosensitive retinal ganglion cells (ipRGCs), which contain the photopigment melanopsin and are involved in nonvisual responses to light, such as circadian entrainment. These cells are intact in legally blind individuals that maintain the ability to detect light in the absence of functional rods and cones. Some ipRGCs terminate in posterior thalamic nuclei (Po) that also respond to dura stimulation. This convergence of light and dural signals suggests an integrative role for the posterior thalamus in light-induced migraine pain. It is also consistent with neuroimaging studies in patients that have shown thalamic activation during migraine. The predominant CGRP-immunoreactive cell bodies in the thalamus are found in the subparafascicular nucleus, posterior thalamic nuclear group, peripeduncular nucleus and areas ventromedial to the posterior thalamic group. These CGRP-containing neurons relay and integrate somatosensory and nociceptive stimuli from ascending pathways; CGRP and its receptor are in the appropriate neighbourhood to modulate trigeminovascular and photic activation of thalamic neurons. A more comprehensive and cautious analysis must include the possibility that CGRP could also modulate photophobia by actions in other brain regions. CGRP-immunoreactive cell bodies and fibres are prevalent in nuclei of the hypothalamus, ventral tegmental area, selected brainstem nuclei, periaqueductal grey (PAG) and cerebellum. Likewise, CGRP-binding sites have been mapped to many regions of the CNS, including the cortex, limbic system (amygdala, nucleus accumbens, hypothalamus) and brainstem (PAG, medulla, pons). Some of these regions also receive projections from the ipRGC. The ipRGC inputs to the extended amygdala (medial nucleus and BSTN) are of particular interest. The amygdala is known to relay nociceptive information, and the medial amygdala is a convergence and integration site of photic and olfactory stimuli that modulate reproductive behavior. These CGRP-containing fibres mediate conditioned autonomic and behavioural responses to acoustic stimuli or somatosensory stimuli. Similarly, the presence of CGRP-containing fibres and receptors in the PAG, which contains ipRGC fibres, should also be considered as potential sites of CGRP action in photophobia behaviour. CGRP-immunoreactive cell bodies are found in the PAG, which is part of the descending pain inhibitory system and cooperates with the amygdala in processing fear and anxiety. Based on the role of CGRP in migraine, and the desire for a nonvasoconstrictor treatment, CGRP receptor antagonism was proposed as a potential therapeutic target. The ability of CGRP receptor antagonism to treat acute migraine attack was initially established with Olcegepant. The first potent and selective non-peptide antagonist of the human CGRP receptor was originally referred to as BIBN4096BS, but has been renamed Olcegepant. The particular affinity of Olcegepant for the CGRP receptor has been shown to be dependent on residues within the extracellular region of RAMP1 rather than the CLR or RCP subunits. Since this site is required for selective binding of CGRP, Olcegepant functions as a CGRP receptor antagonist by directly competing for the binding site of the endogenous ligand CGRP and, therefore, inhibits the physiological and cellular effects of CGRP. Olcegepant was shown to lack vasoconstrictive effects based on a study in which infusion of Olcegepant to healthy volunteers caused no significant systemic or cerebral blood flow changes and was shown to suppress the stimulatory effect of CGRP on its own synthesis in trigeminal ganglion neurons. Results from a IIa phase clinical trial on olcegepant provided the first direct evidence to support the use of a non-peptide CGRP receptor antagonist as an abortive therapy of migraine. Findings from that clinical proof-of-concept study not only demonstrated that Olcegepant was as effective as oral triptans, which are regarded as the most effective class of abortive anti-migraine drugs, but also demonstrated its safety and minimal adverse event profile. In particular, the finding that olcegepant appeared to lack cardiovascular side effects of triptans such as changes in basal blood pressure or heart rate may prove to be advantageous for this new class of compounds. However, despite their in vitro potency, large amounts are necessary to obtain a significant antimigraine effect in vivo, possibly owing to high protein binding, low passage through the blood–brain barrier and being substrates for the efflux transport system P-glycoprotein pump. To facilitate a more useful delivery method, Merck Research Laboratories undertook a research programme to discover compounds that were potent oral CGRP receptor antagonists. One compound that was identified using this approach was the selective CGRP receptor antagonist, MK-0974, which has now been renamed Telcagepant. Findings from pharmacological studies have shown that Telcagepant is a highly selective potent, oral antagonist of the human CGRP receptor. The efficacy and safety profile of Telcagepant in the acute treatment of migraine was initially demonstrated in a phase II clinical trial. In that study, Telcagepant was shown to be effective and generally well tolerated for treating moderate to severe migraine attacks with a primary endpoint of pain relief at 2 hours. Telcagepant also displayed superior efficacy versus placebo for secondary endpoints such as sustained pain relief at 24 hours and sustained pain freedom at 24 hours and relief from migraine-associated symptoms such as photophobia, phonophobia and nausea. Unfortunately in a IIa phase exploratory study, a small number of patients taking Telcagepant twice daily for 3 months for the prevention of migraine showed marked elevations in liver transaminase levels. As a result of these findings, the company had initially considered discontinuing clinical development of Telcagepant. More recently encouragingly, other members of this family have recently been modified to retain the potency of Telcagepant and yet minimize the susceptibility to oxidative metabolism, which is believed to be involved in hepatic toxicity. Based on preclinical data, blocking CGRP receptor activation would be expected to affect the function of vascular smooth muscle cells, mast cells, trigeminal ganglion neurons, glial cells and second-order neurons within the CNS. If the headache phase of migraine is dependent on nociceptive input from perivascular sensory nerve fibres as recently proposed, then inhibiting dilation of human cerebral and meningeal vessels, which express functional CLR and RAMP1 proteins, by blocking CGRP receptor function would be beneficial. Similarly, inhibiting activity of CGRP receptors that are expressed by dural mast cells would prevent mast cell degranulation and the subsequent release of histamine and other proinflammatory agents known to cause peripheral sensitization of trigeminal nociceptors. Other likely peripheral targets of CGRP receptor antagonists would be the neuronal cell body and associated satellite glial cells located within the trigeminal ganglion, since both of these cells express functional CGRP receptors. While blocking the CGRP receptors on trigeminal neuron cell bodies would prevent further synthesis of CGRP, inhibition of CGRP receptors on satellite glial cells would repress the stimulated release of cytokines as well as nitric oxide, which can cause sensitization and activation of trigeminal neurons. Inhibition of CGRP receptors on second order sensory neurons within trigeminal nuclei in the caudal brainstem and upper cervical spinal cord would directly block further nociceptive signalling in the CNS and, thus, prevent the development of central sensitization and hyperalgesia. Another approach to block the effects of CGRP is either the use of specific CGRP Antibodies that bind excess of CGRP and thus hinders its effects, or the use of a specific CGRP-binding RNA-Spiegelmer (a single-stranded mirror-image oligonucleotide) that is capable of tightly and specifically binding to CGRP and thus inhibiting its function. It has been revealed that the application of antibodies for CGRP is a possible way of reducing the effects of CGRP. Thus, chronic treatment with anti-CGRP antibodies exerted a long-lasting inhibition of neurogenic vasodilatation. The advantage with this approach is the long half-life of the effect, which opens up the possibility for its use in the prophylaxis of migraine. The rationale for the development of specific CGRP receptor antagonists is firmly based on translational research. CGRP Receptor Antagonism is now regarded as a prime target for the development of novel antimigraine therapies. Clinical trials with Olcegepant and Telcagepant have demonstrated that CGRP antagonism is an effective acute antimigraine mechanism and has no significant acute side effects. At present, there is no evidence that the novel CGRP receptor antagonists have direct contractile effects, and this may provide a significant advantage over the triptans. Future research will probably explore other molecules that might contribute to the pathogenesis of migraine, such as histamine and proCT. Additional antimigraine therapies are also being developed targeting glutamate receptors, which could potentially be modulated by CGRP. It seems likely that experiments will continue to examine the relationship between the nervous and immune systems, especially the interplay of CGRP with the immune system. The identification of sites of CGRP action in the CNS should lead to more insights and improved therapeutics for migraine. In this way, increased understanding of the impact of CGRP on the trigeminovascular system will continue to propel us closer to successful therapeutics for migraine.